But because of the extra weight of the turret and the gunner, and because the shape of the turret impaired streamlining, it was slower and less maneuverable than its more conventional counterparts, which turned out to be a fatal flaw. This is a well-known story. The Defiants had an initial advantage, because of their resemblance to Hurricanes, so German pilots thought they were safe attacking from the rear, which of course was exactly the wrong thing to do. 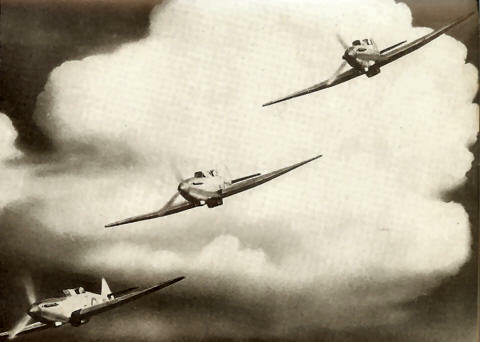 But once this was realised, Defiants were terribly vulnerable: 141 Squadron lost 7 aircraft and 12 men in the space of half an hour, after being bounced by Me 109s on 19 July. They had to be rescued by a squadron of Hurricanes. Spaight obviously hadn’t heard of this, and was still lauding the Defiant as a powerful new air superiority fighter. He clearly expected it to play a important role in the Battle of Britain then raging over his head. Instead it was soon relegated to night fighter duties, where it did it fact do good work during the Blitz. 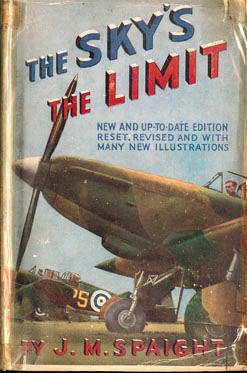 So the Battle of Britain Spaight expected was different to the one that was actually unfolding as he wrote. And that’s just for the British side of things — his thoughts on the German aircraft were even more ‘alternative’. I’ll discuss them in the second part of the article. In the opinion of contemporary press, hopes were running high for Defiant right through the Battle of Britain. In fact, the type was removed from 1st line service following the disaster of No. 264 Squadron on 28 August 1940, when five aircraft were lost to German Bf 109s with the deaths of nine crew members. The profile shows PS-A Defiant Mk.I of that unit, based in Kirton-in-Linsey during the period.